I experiment with the snake some more and figure out that I can climb it to reach the ceiling, resulting in another death message as I hit my head and subsequently get bitten by the snake. But isn't there some place I couldn't reach otherwise? Yes, the top-right corner of this level – this must be the solution! I hurry back there and...encounter the monster again. I save the game and try to attack it with everything I'm carrying – but the verb “attack” is not really viable in this two-word parser that doesn't leave room for the variable “with x”. Hmm, what else could I do? I try giving items to the monster next but no matter what I do, I die trying. Finally, I try to throw the dagger and at least the command “throw” appears to work. Without giving it any more thought, I restore time and again and throw everything I've got at the monster – the dagger, the calculator, the flute, the jar, the snake in the box, the blue wool. After so many unsuccessful attempts, I even hesitate to throw the wool but do it anyway and...the monster gets all tangled up and falls down. Success? Not yet, but a quick final attack with my dagger (“kill monster”) results in the strangely elegic message “The monster is dead and much blood is spilt!” Alas, poor Yorick. With another puzzle out of the way I am eager to get upstairs via the snake and it works! My dagger vanishes in the meantime but what I discover up there should make up for it: a sword! Unfortunately that's about all that I manage to do. I set about collecting the other items, playing the horn, trying to put the yoyo to good use but I seem to be stuck and starve yet again after a while. As I have saved before slaying the monster, I have to go through it again and find it in the same spot as before – maybe it's not a random encounter after all. This time, however, I notice that the message does not tell me that the dagger has vanished as I'd previously assumed, but the monster's body. Is this somehow important? I restore back with the intention to search the body this time. 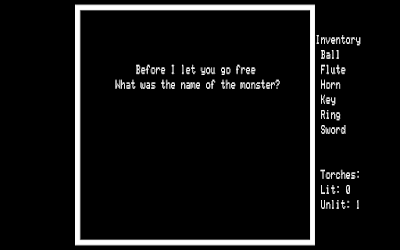 Also, I try to create a save game just before confronting the monster but am told that it was currently impossible. The monster kills me once more and I have to restore – I'll have to save just before entering that corner of the map. Searching the body results in the game telling me that I don't make much sense (I beg to differ, naturally), and if I try to examine the dead monster the body vanishes right away. Maybe it's not important and I might be seeing things but the fact that the monster's blood is so explicitly referenced makes me think otherwise. I restore again and try to pick up the blood in various different ways but the parser doesn't know the word blood and is generally unhelpful about the whole situation. After minutes of restoring and trying out different wordings I try to fill the empty glass jar with the blood – in two words: “fill jar”. That works and I've now got a jar full of monster blood to my name, although the reason for it is beyond me. Unfortunately that's it: I don't find a way down to level 5, I don't find a use for any of the other objects, I run around the empty maze pointing my sword at everything and don't know what to do next – at all. I experiment with the elevator (a lot) but it only gets me back to level 3. As the built-in hint system doesn't have anything that applies to my situation, I decide to consult the official hint sheet and decode hint number 9: “Are you stuck on the second floor?” Oh yes, I am, and how! The answer is somewhat baffling: “press two.” How on earth should I have come up with this? What does it even refer to? It is the only number on the calculator's display I haven't used yet, okay, but how would that make me press it three floors down to magically teleport somewhere else? Of all the unfair puzzles in Deathmaze 5000, this is so far the worst. At least I didn't take a hint for nothing: I'm on the final floor! The limited inventory makes me change my plans a little – as I probably won't be able to travel back and forth between the fourth and fifth levels the way I could between the third and the fourth, I go back to the beginning and create multiple savegames carrying different items before attempting to map the fifth level. Luckily, the endgame is pretty straightforward. Many of the items prove to be unnecessary and it's rather easy to figure out which were not. Mapping the fifth level is a pain since it mainly consists of dead ends. There is only one item – a golden key –, no food, no torches, two more monsters as well as another elevator trap. I have to restore a few times but work out the “puzzles” pretty quickly. The most painful obstacle is that my torch is perpetually blown out the moment I entered level 5. I first assume that I have to find my way in the dark until I figure out that this is what the ring is good for. If you hold it above your head the torch-hating ghost vanishes and exploring is much less difficult. After a few corners I encounter a vampire bat that attacks me right away. Throwing the blood at it predictably puts it off my scent and somehow the blood appears to be poisonous and the bat dies. At another point I am attacked by the monster's mother. 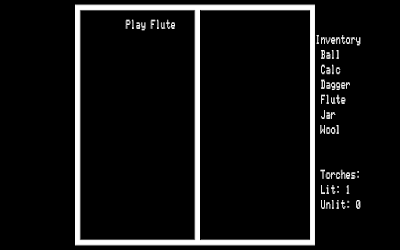 Having no more wool I try the frisbee in one of the savegames and the horn in another – and the latter is the solution. The horrible sound of the horn somehow seduces the mother and I am able to kill her in cold blood. Even without any graphic representation this kind of stirs me – the game is not only brutal for the player, it seems. The final stretch is also straightforward – sort of. The golden key fits in any of the five keyholes but opening four of the doors kills me right away. At least I don't have the chance to react to any of the fatal traps, thus the wrong doors are very clearly marked and don't make me waste any time. Behind the first door, I am taken away by three men in white coats, interestingly prefiguring the topic of (in)sanity that will be so central in later Med Systems games. The second door contains a 600 pound gorilla that rips my face off. Door number three kills me with a 20000 volt shock and door number five – yes, the fourth one actually lets me live – drops a wall on me. Having been slain four more times, I pick the right door and the key starts to tick like a time bomb. As the dungeon map has a strange nook in the bottom right corner I assume that something must have happened down there as I am not able to enter the now open door number four. When I arrive down there another keyhole has materialised and I am able to enter the final stretch of the dungeon. The game warns me not to make any unnecessary turns, really turning up the stress level. At the end of the line there is another elevator but this one stumps me. I try all of the items I haven't previously used to not die inside and throwing the crystal ball somehow does the trick, don't ask me why. 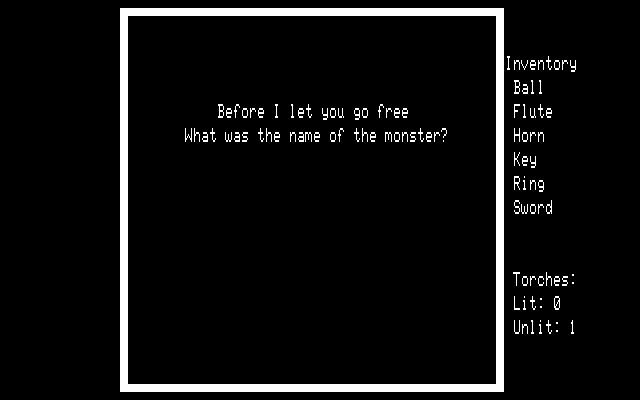 The game ends with a trivia question about the name of the monster. Yet one more obstacle and it really makes me think and almost makes me go back – was that mentioned somewhere in-game? Should I have talked to the beast or to its enamoured mother? Phew, another restore seems very likely but then I remember that I read somewhere in preparation to the game that a passing knowledge of the medieval epic “Beowulf” would be necessary to solve it. I had actually been wondering at which point the “Beowulf” references could be found. My knowledge of “Beowulf” extended as far as to remember that Beowulf first killed a monster and then the monster's mother seeking revenge – like me. But what was the monster's name? I decide that consulting outside knowledge is fair game (the Trickster established a precedent when he looked up the name of Roy Rogers's dog) and correctly come up with “Grendel”, winning the game with one in-game hint, one look at the official hint sheet and one instance of consulting Wikipedia. Had I not accidentally read about the “Beowulf” connection, I don't know...probably it wouldn't have occurred to me, so let's mark that down as a third hint of sorts. 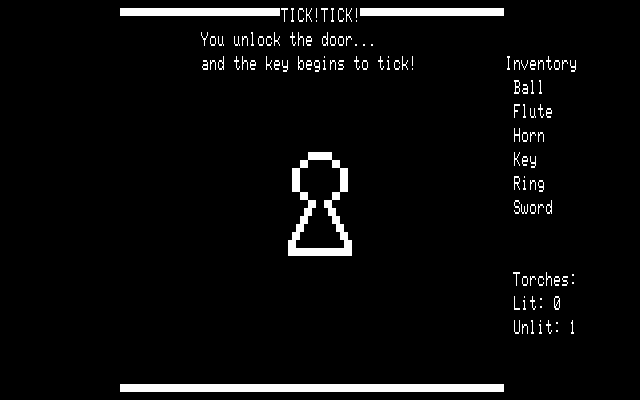 Deathmaze 5000 is really brutally difficult but I actually had a lot of fun playing it – for its simple story it's at least not one of those dreadful treasure hunts (the remaining items are not mentioned at all and there is no scoring system) that made up so many early text adventures. The final message was another hint that the deathmaze may have been connected to mental issues of sorts, again setting the stage for later Med Systems games like Asylum and The Institute: “You have survived! RESET TO SANITY!” Thanks...I think. Puzzles & Solvability: Deathmaze 5000 does not have very many puzzles but the few there are really made me rack my brains. I had to peruse three hints and stumbled on some other solutions (“raise ring”, I'm looking at you) by pure luck and parser juggling. I don't believe that anybody actually solved this game without the official hint sheet (it was sold for $1, if you're interested) or the in-game system. The challenge was kind of fun but it's still a very, very punishing game: 2. Interface & Inventory: As basic as it gets. 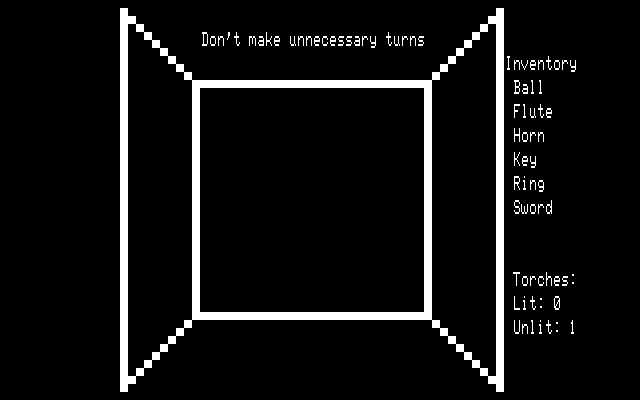 While the idea of setting an adventure game inside a 3D maze was revolutionary for the time and the game makes excellent use of the TRS-80's very limited capabilities, the inventory is only a list of items and most of them cannot be examined. The two-word parser is also very simple and the words you type actually appear right within the frame that is meant to depict the maze – I have to say that I've never seen that before: 1. Story & Setting: All bones and no flesh, really. Escape from the maze. Why? No idea. Where from? Not mentioned. Where to? Who knows. I liked that it was no conventional treasure hunt but the game truly doesn't have a story longer than two sentences and the setting is pretty sparse, too: 1. Sound & Graphics: In 1980 and on the TRS-80, Deathmaze 5000 was sensational. It didn't feature the tutorial from Rat's Revenge (see post #1) anymore but rightfully trusted in its abilities to depict a (very, very simple) 3D environment. Then again, there is no sound and the graphics are limited to walls, pits, elevators, keyholes, a perfect square and boxes. Enemies are not visually represented, so how do I rate this? Even if it's a technical feat for 1980, it's still pretty basic: 2. Environment & Atmosphere: In spite of all its simplicity, Deathmaze 5000 somehow grabbed me. 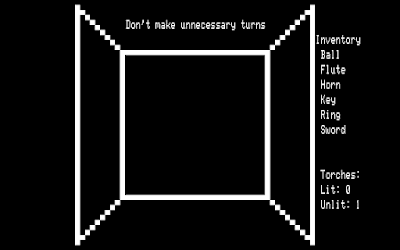 The atmosphere is really claustrophobic and the environment has all the positive qualities of its early peers (Dungeon/Zork, Advent) without much of the silliness. Mapping the maze is more fun than work, too, so this is where Deathmaze 5000 sort of shines: 3. Dialogue & Acting: No acting, of course, and the dialogue is very sparse. Sometimes it's mocking, sometimes it's absurd but it's still okay and contributes to the atmosphere. I liked the fact that it's not overly silly and I even liked the cryptic final message. In keeping with the times: 2. This low score does not reflect my enjoyment but I already suspected that the PISSED rating would not be favorable. Deathmaze 5000 is definitely an interesting beginning for Med Systems adventures and I'm already looking forward to playing Labyrinth next. That's one harsh game! But 1980 was a very different time. I agree. 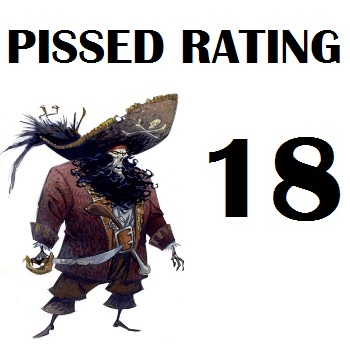 The PISSED rating has been harsh on the game, accordingly. 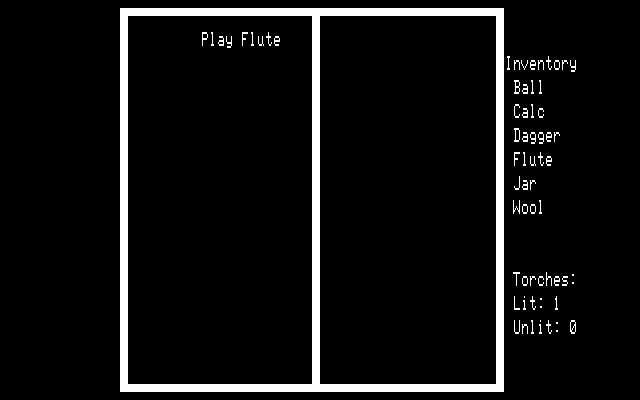 If you go to TRS-80 sites for information about the game it‘s interesting to see how many people remember it fondly because they spent weeks solving it. Hence, why I guessed something even lower. I‘m curious to know what that was! I still preferred Deathmaze 5000 over the early Sierra games. The desert in The Wizard and the Princess is harsh on a whole other level. Deathmaze 5000 lets you run into a wall quite a few times, yet it never feels totally unfair despite the horrible calculator puzzles. The built-in hint system is a nice touch, too. I probably would have referred to it more often had I not played it for TAG. Michael wins the CAPs for the best score guess! Those will be distributed with the next main-line game, as well as Will's inaugural CAPs for playing through a game for us. Wow, sweet caps! I‘d forgotten all about them - what a pleasant surprise! Congratulations for completing your first game, Will! 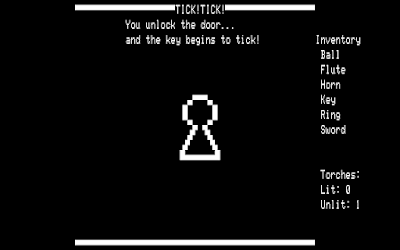 I've used to early adventure games being more about puzzles than the plot, but here even those didn't make any sense. I guess the maze routine took so much of the available memory that there wasn't any room left for hints and such? Thank you, Ilmari! The game actually has a built-in hint system which is pretty neat. I didn‘t use it more often because my TAG mission made me overly ambitious. About the use of memory: My guess is that you‘re spot on. Med Systems added more puzzles and plot in their later games, though. "I don't believe that anybody actually solved this game without the official hint sheet"
I'm sure that in these early days, devoted adventurers would not hesitate to peruse the program's actual source code listing, especially when written in BASIC, in search of guidance. Save the $1! Assuming that $1 was postage included, that’s not a very unreasonable price for the sheet, even in 1980 dollars. I’m sure they sold more than a few. Except for the impatient people, that would have resorted to reverse engineering the code. Although sending an envelope with a dollar is a lot less effort than reverse engineering the code it never ceases to amuse me to how much trouble we will go through just to avoid going outside. That said the outside references in games in the early days were always an annoyance to everyone outside the US who were not always subjected to the same culture, there is simply no way in hell we would have been able to figure out the dog's name. Beowulf is a little more fair as anyone playing the game in English should be aware of the legends or be able to look it up in an encyclopedia (good luck explaining that one to your kids one day btw) at least. Re: encyclopaedia - Wikipedia in a paper format? Ilmari, assuming that's a serious question -- it's what inspired Wikipedia. An encyclopedia is basically a series of books of 10-years-past knowledge sitting on the bookshelf of a family living room, covered in dust from lack of use. Well, I was trying to answer ShaddamIVth's comment "good luck explaining encyclopaedia to your kids one day" and giving a short explanation that they might understand. It has to be said though that not mentioning the information was indeed 10 years old at best and that it covered most topics briefly (if at all) would miss the essence of an encyclopaedia collection, although I did read through ours when I was younger. I also read through most of the Grolier encyclopaedia on our old 485 in the brief window that cd encyclopedias were a thing, always reminds me of the FMV games as they became popular at about the same time. @Rowan: While that is probably true that wouldn‘t be too different from consulting a hint sheet (or using the in-game hint system). @ShaddamIVth: The Beowulf reference is relatively harmless for non-Americans compared to the baseball maze in Zork II, I think. @Ilmari, oops, I misread his comment and didn't realize that's what you were responding to. @Will I agree Beowulf is more than fair, baseball maps would have been practically unsolvable for us back then though (if I had gotten my hands on it in the mid 90's when I first got access to a computer that is). With American programs being watched more all over the world since the 90's we know the basics but just imagine you were playing something from Britain and they suddenly asked you to work out a cricket score, with no Wikipedia to assist you. Thanks for all your effort with the posts it is fascinating to look into the really old games, this is a few years before I was born. True, cricket would have been even tougher! Thanks a lot, that means a lot to me! Looking forward to blogging through the next one already!